It is provide in between straight and circular so that radius is gradually from infinite to R.
1> To gradually introduce the centrifugal force in between straight and circular . 2> To gradually introduce super elevation and extra widening . 3> To avoid sudden jerk . 4> To enable the driven to turn the steering of vehicle gradually for comfort and security . 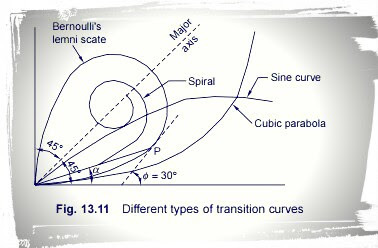 Ideal shape of for transition spiral clothiod because rate of change of centrifugal acceleration is constant throughout. note : For small deviation angle behaviour of all the three types of transition curve are same . Length of transition curve taken minimum value from case 1,case 2 and case 3 . DSS,survey, hydrology, irrigation notes required..